Christmas is a month away. Can you believe it?! This will be our second Christmas in Our DIY House, and we’re all very excited about it. This year, I had the pleasure of decorating our home early for the season as a part of the Canadian Bloggers Home Tour – Christmas Edition! 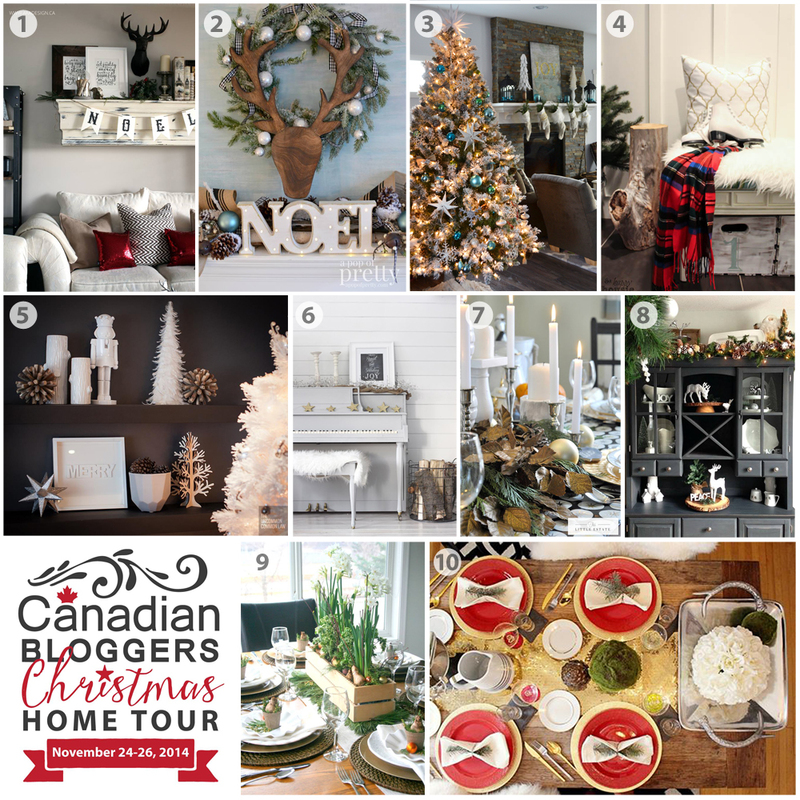 Shannon of AKA Design + Life and I are hosting the tour, and we’ll be linking to several other fantastic Canadian bloggers that are sharing their own Christmas home tours. Please scroll to the bottom of this post to see who else is touring today and what the schedule will be for this week. 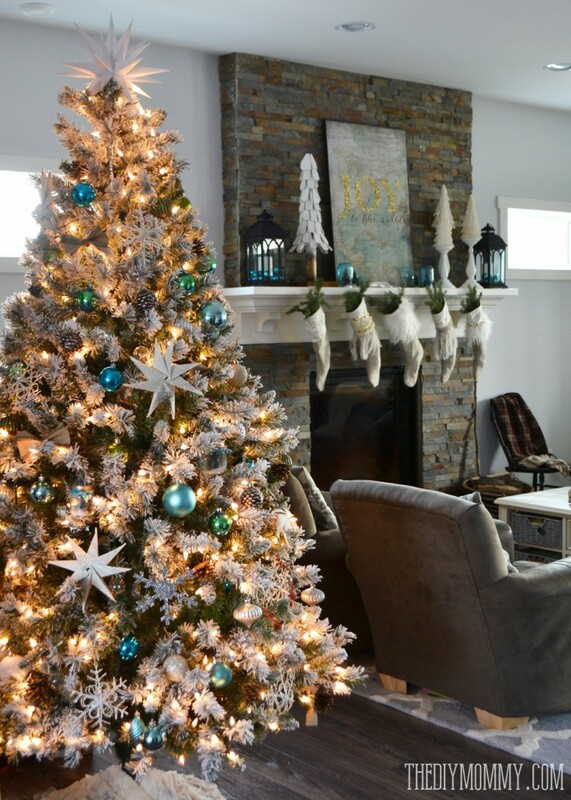 I can’t wait to see my fellow Canadian bloggers’ homes and get some more Christmas decor inspiration! A the end of this tour, you will also find a place to link up your own Christmas home tour – it will be featured on all 10 blogs and we’d love to see what you’ve done in your own home. Now, onto my own Christmas home tour. I decided to try a non-traditional colour scheme of teal and green this year. As much as I adore red, I thought it would be interesting to try to nix it entirely from our Christmas decor this year. 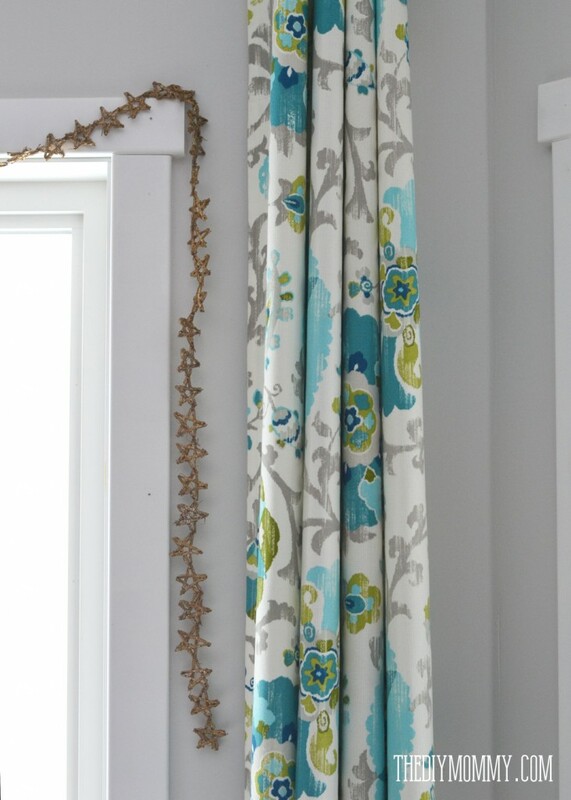 I also thought it would be a fun challenge to attempt to tie in our holiday decor with all of the teal, turquoise and green we have in our home already – especially these drapes in our breakfast nook. Welcome to our house on the prairie & Our DIY House. We built it last year, and we’re still finishing the outside (obviously). I was happy to get this pretty snowy photo, and you’ll have to excuse our porch for now. I’m hoping that it will be done by next Christmas! I hung a simple wreath I’ve had for a few years on our front door. Last year, I stuck a giant sparkly teal poinsettia in it. I love it. 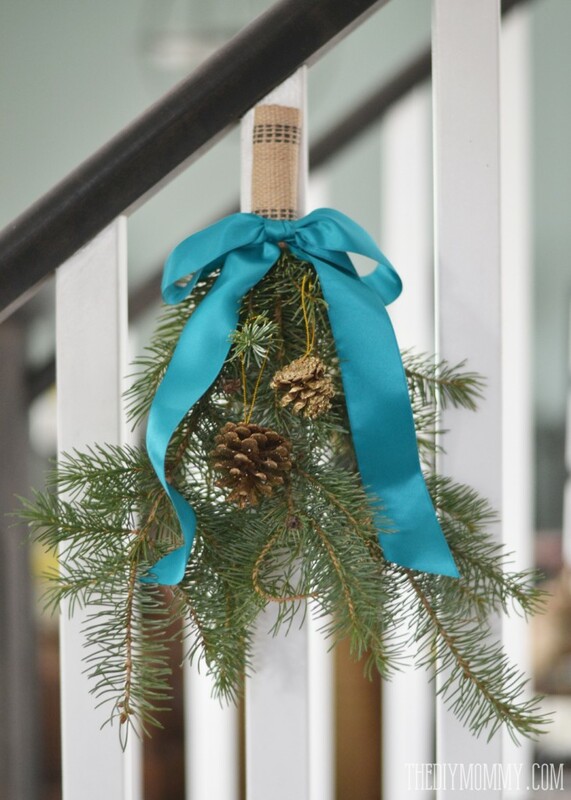 Upon entering our Christmas home, you’ll see our staircase decorated with simple swags I made with clippings from my mom’s pine trees, some pine cones, some upholstery webbing, and teal satin ribbon. I’m smitten with their sweet simplicity. To the right of our front door is our Ikea shoe cabinet, and I’ve moved the mirror that was over our fireplace here and decorated the top of the cabinet with some simple seasonal things. The jar is a recycled pickle jar sprayed with mirror spray paint and dusted with oil rubbed bronze spray paint to create a pretty mercury glass effect. I filled the jar with some spruce tree clippings – you’ll see lots of tree clippings around my Christmas home. They’re so pretty, and I love that they’re free! Our family room is the first room you see upon entering our home, and it’s the one I’ve decorated for Christmas the most. 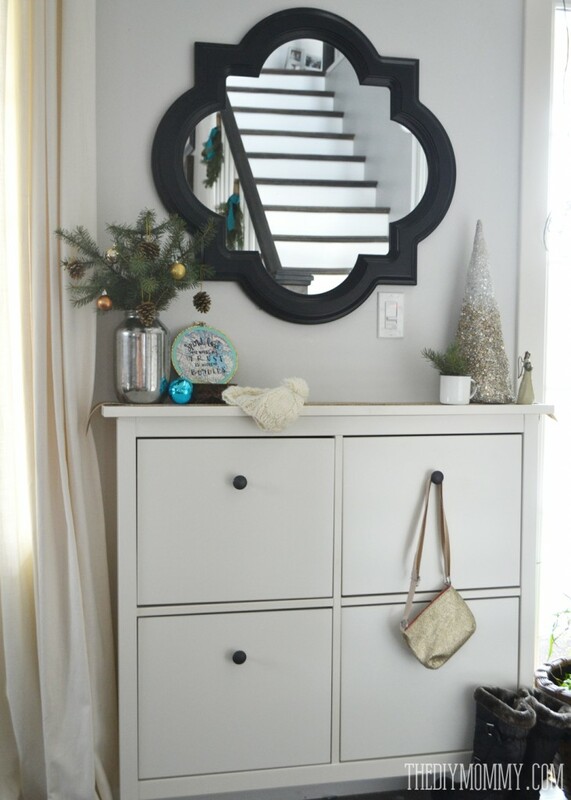 I’m loving my DIY recycled door advent calendar as a feature in this room. 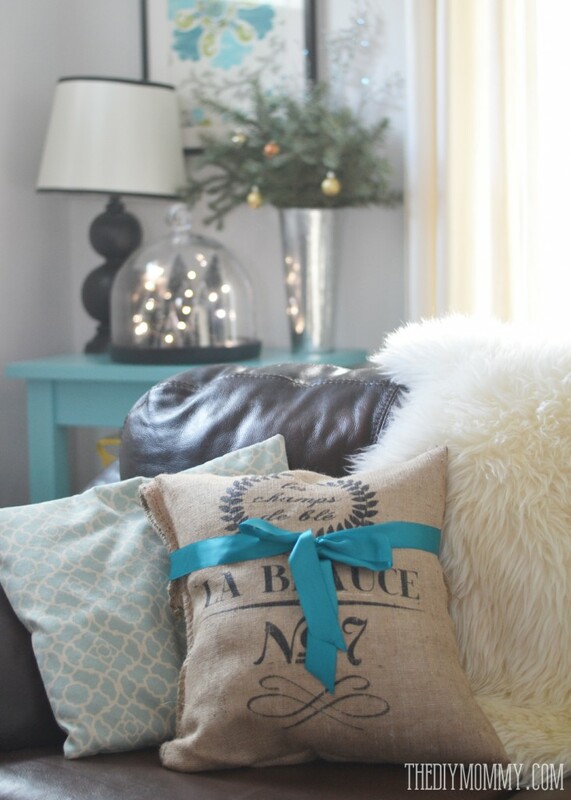 The grain sack pillows are made from reproduction French grain sacks from OnlineFabricStore.net and I’ve made them a little festive wrapped with teal satin ribbon. 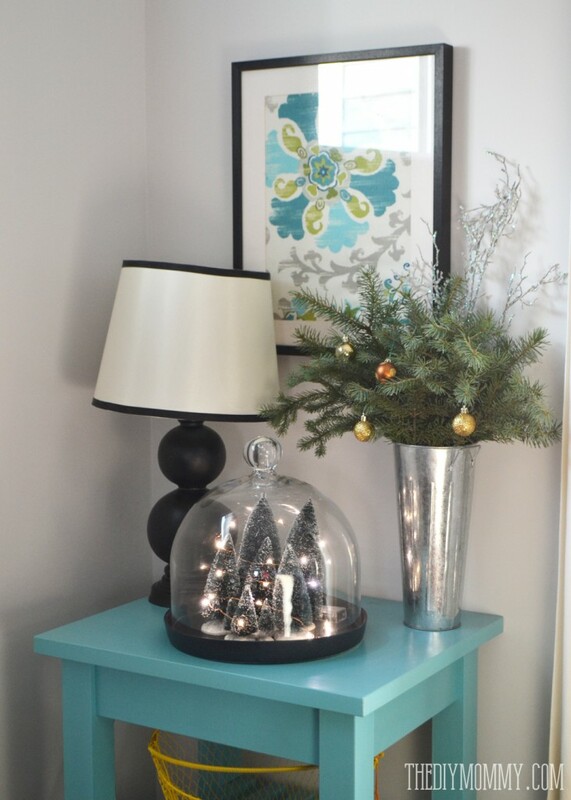 In the corner of the family room, I’ve decorated my Ikea cart with some bottle brush trees in a dome server, wrapped in adorable little twinkle lights. I’ve thrown some spruce clippings in a vase and bedecked them with little gold ornaments. Our Christmas mantel! Oh, how I love the way it turned out this year. I printed off a very large 24″ x 36″ version of some vintage map Joy to the World artwork that I made (and sell here) and created a glittered canvas out of it. Click here to see how I made the glittered canvas from my Joy to the World art. The Anthropologie inspired burlap linen stockings are handmade (the tutorial is here), and the large wooden tree on the left was a purchase from Winners last year. On the other side of the canvas, I quickly made some ruffled trees out of coffee filters to sit atop my Ikea candle sticks. The mantel is flanked with some lanterns filled with turquoise ornaments, and I put some little bottle brush trees in blue mason jars around my large artwork. Opposite our fireplace is our TV stand and gallery wall. I like how my little gold-dipped turquoise chair looks with all of our Christmas decor. Our TV gallery wall now has our latest family picture in it, and I threw some turquoise and green Christmas ornaments in a thrifted bird cage decoration to sit beside our TV. I’m madly in love with our new flocked Christmas tree from Lowe’s. You can read more about it here along with the details of how I decorated it in blues, greens, silvers, and whites. Tucked in the back corner of our family room is our “kids corner” with a little table, chairs, and our craft shelf. We always put out this wee nativity set each year to remind us why we celebrate Christmas and the girls love to play with it. My mom and I made these adorable little evergreen wreaths one morning last week. Her grandpa was a master gardener of an estate in Germany and taught her how to make them when she was young. Here’s the tutorial on how to make DIY real evergreen wreaths. I think they really add a natural, festive touch to our kitchen. 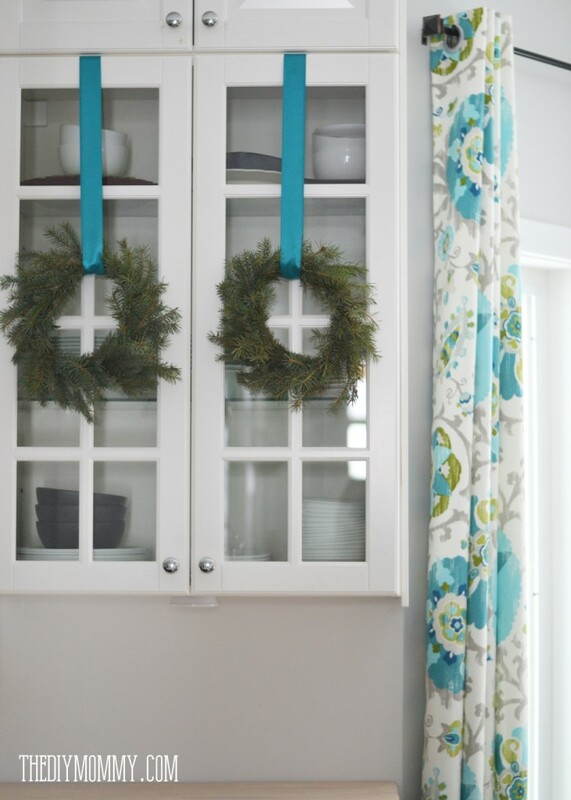 I strung them from all of our windowed cupboard doors with satin teal ribbon. I changed out the artwork flanking our sink window with some that I sell here. 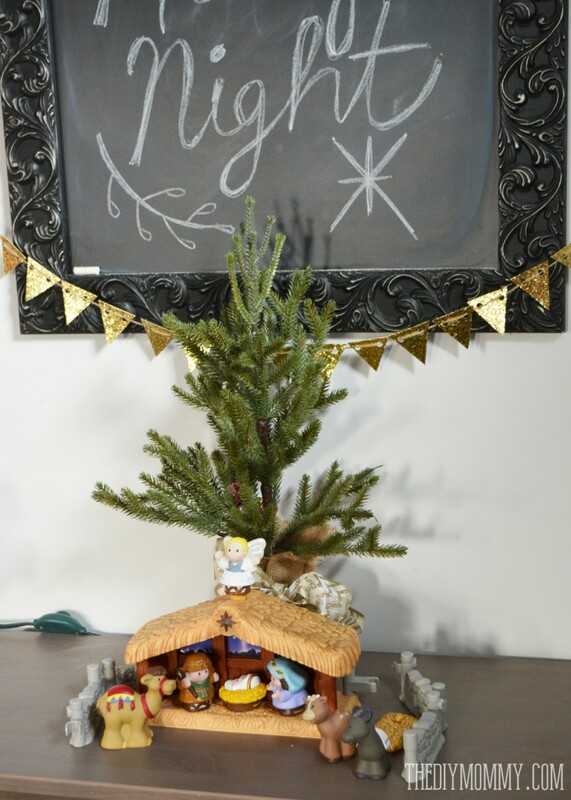 The “Peace” sign in the kitchen window is thrifted, and the little tree is from Michael’s last year. I strung the sparkly golden star banner that was on our Christmas mantel last year over our breakfast nook window. My friend made this gorgeous centerpiece for me out of old barn wood, and I filled it with spruce clippings, pine cones and candles. The “noel” sign was from Winners last year, and we’re going to hang our Christmas cards on our rotating art wall curain rod behind our kitchen table. 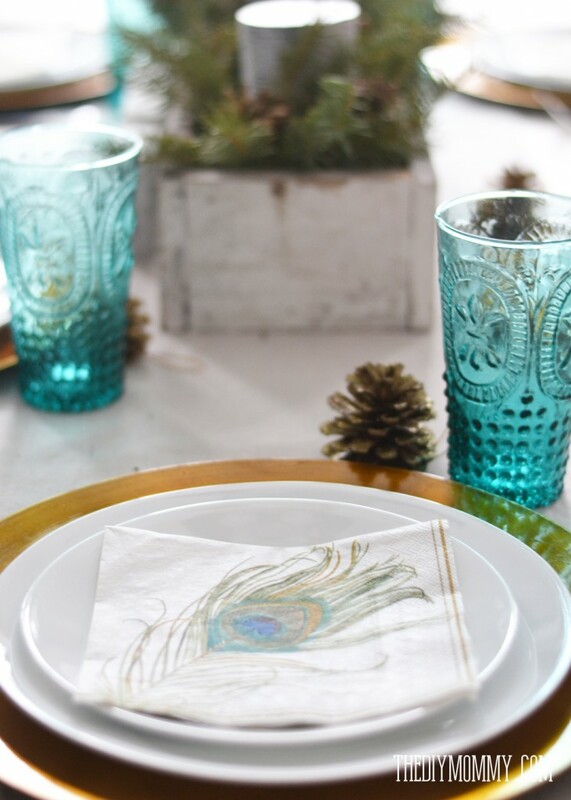 I’ve stacked simple white dishes on some gold charges I found last year at Michael’s, and finished the setting off with peacock napkins I found at our local antique store this year, my teal hobnail glasses, and some golden pine cones. My DIY drop cloth table runner sets everything off in a simple way against our white kitchen farmhouse table. The final room of our tour is our formal sitting room around the corner from our kitchen. It’s not quite done yet (still), but I had fun dressing it in a bit of Christmas cheer with spruce clippings, wrapped gifts, and a soft sheepskin over the settee. Thank you for coming along with me on our teal & green vintage inspired Christmas home tour! I hope you liked it! I’m really enjoying the non-traditional colour scheme we have going on this year, and I’m also proud of the fact that I hardly bought anything new. It’s fun to see what you can re-make from old things you already have, or free and thrifted items that you can make look festive and beautiful. It is all so beautiful Christina! 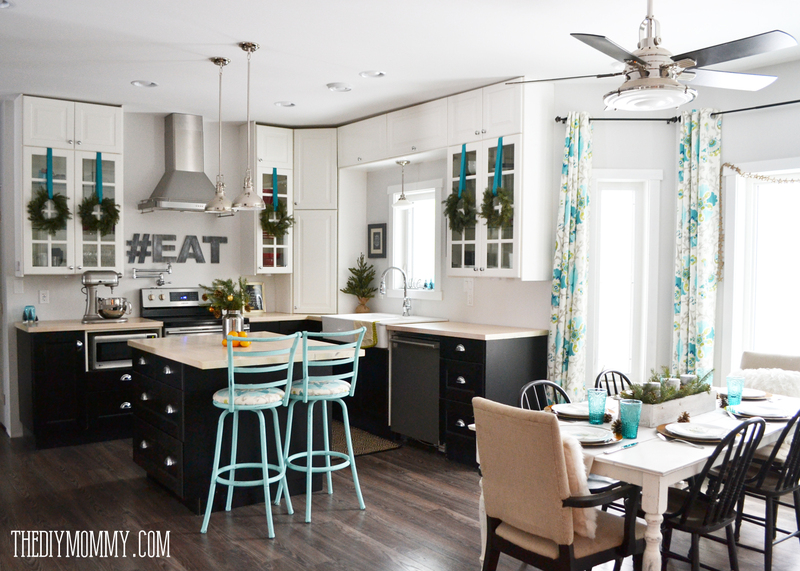 Love the teal touches everywhere! And yes, I love those wreaths hanging on your kitchen cupboards! (Thanks for the opportunity to link up our tours too! I post mine in Dec. so I defiantly will then 🙂 Have a great week! It all looks SO beautiful Christina!!! I LOVE the teal touches! 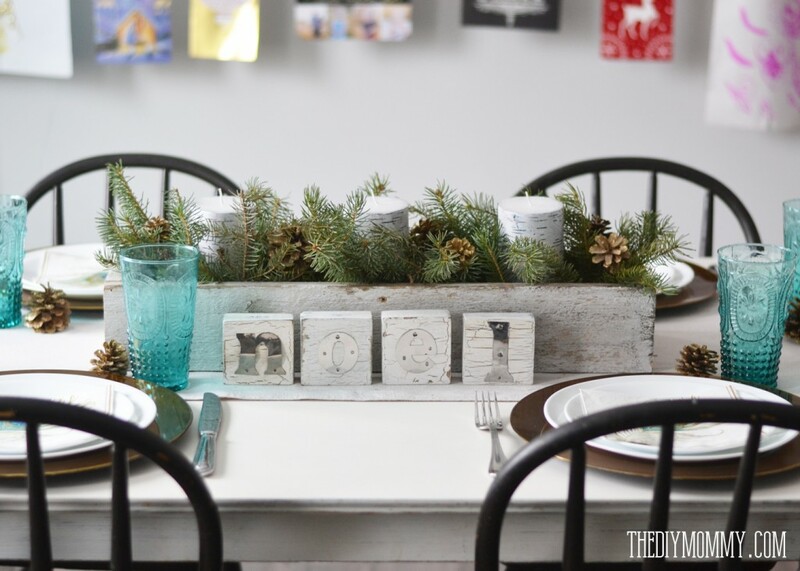 Those little wreaths that you made for your Kitchen are so sweet – I cannot wait to see the tutorial! Also loving you gorgeous tree and those beautiful new stockings!!! Love your house, Christina! It looks so pretty! I love doing this tour with you! Gorgeous colors, I was pinning away for inspiration! 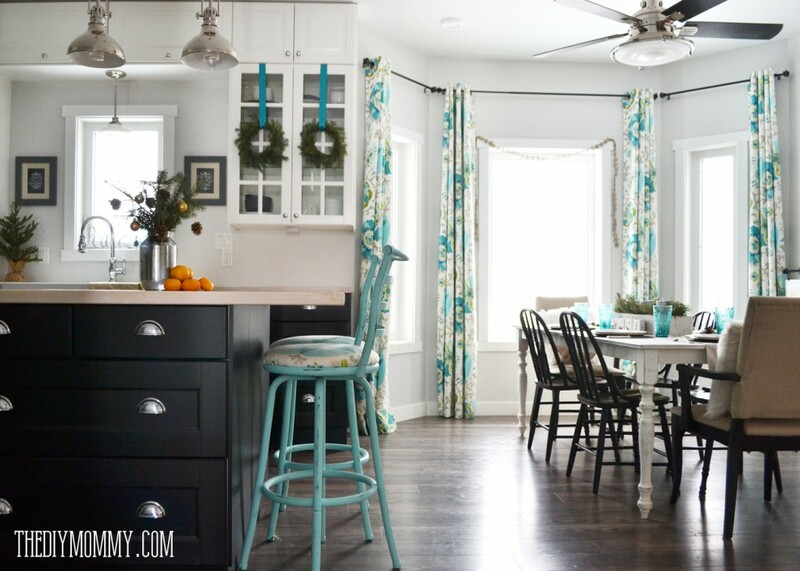 Your kitchen with the pine wreaths, just so beautiful! 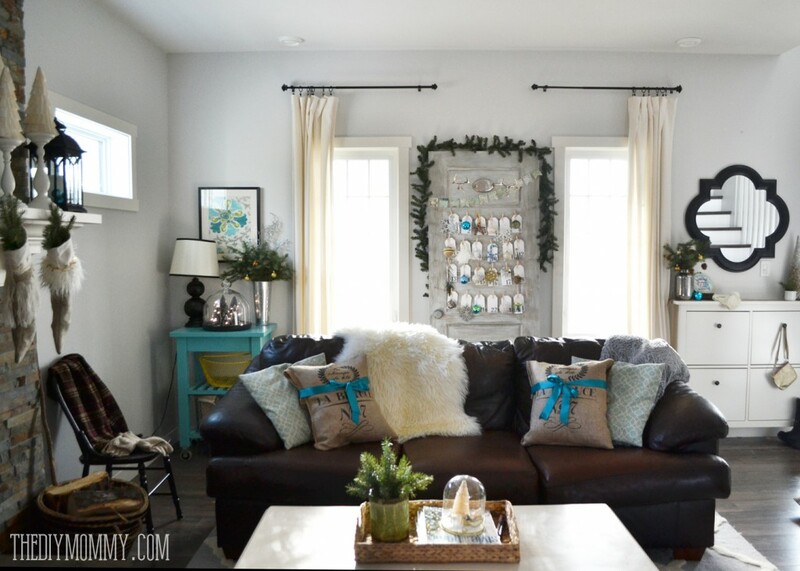 I also love how you wrapped a bow in teal around some of the pillows for an accent color. 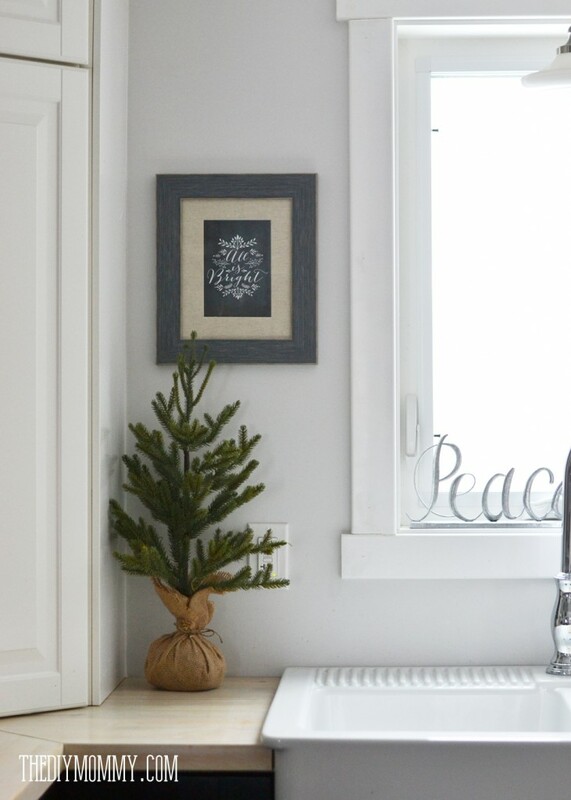 The mini wreaths on your kitchen cabinets are so. charming. !! 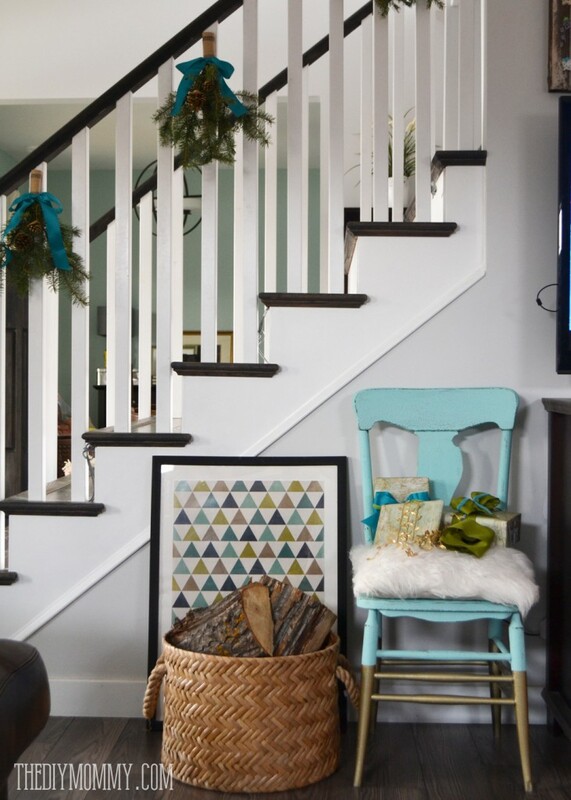 Your Christmas décor is stunning – so fun with the colour combo and love how it ties into your existing décor. Your tree is stunning! 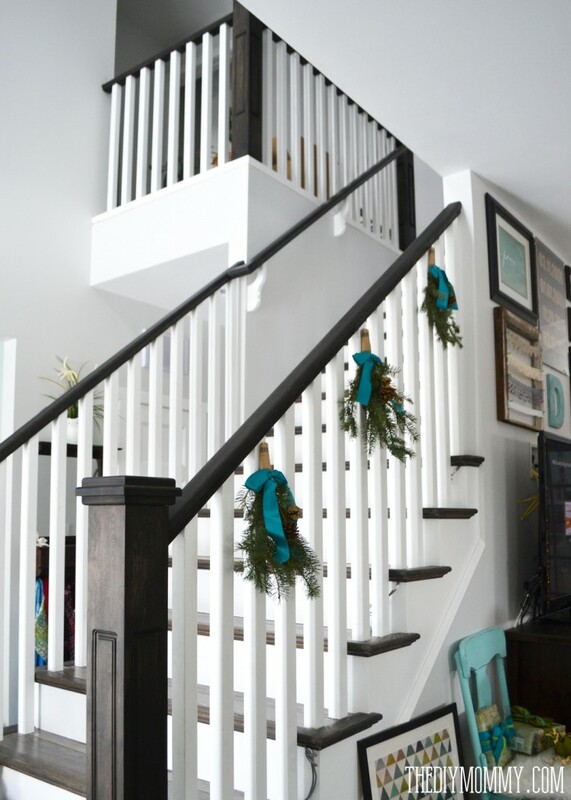 You’ve built a magnificent house – your staircase is terrific and makes a statement with the black and white. I am so happy to have found this tour of Canadian Bloggers! Everything looks so beautiful. 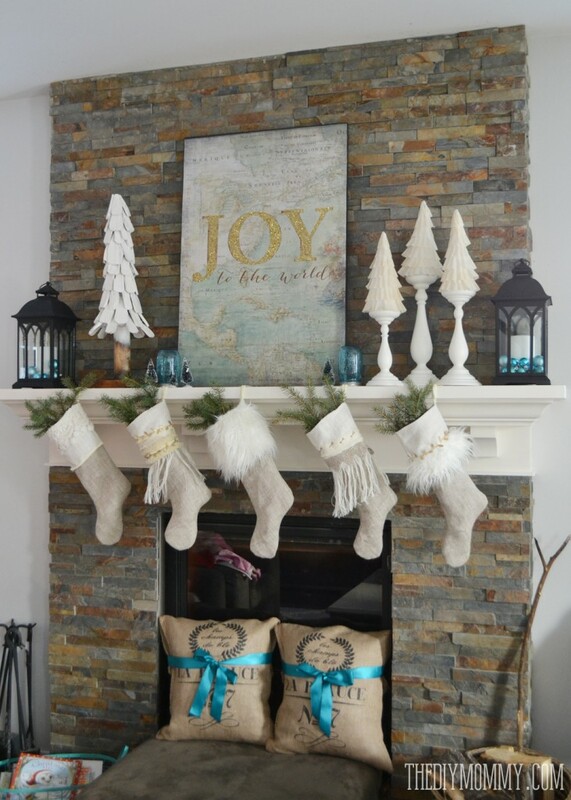 Love your mantel and the Joy to the World sign you made! Beautiful, Christina!! 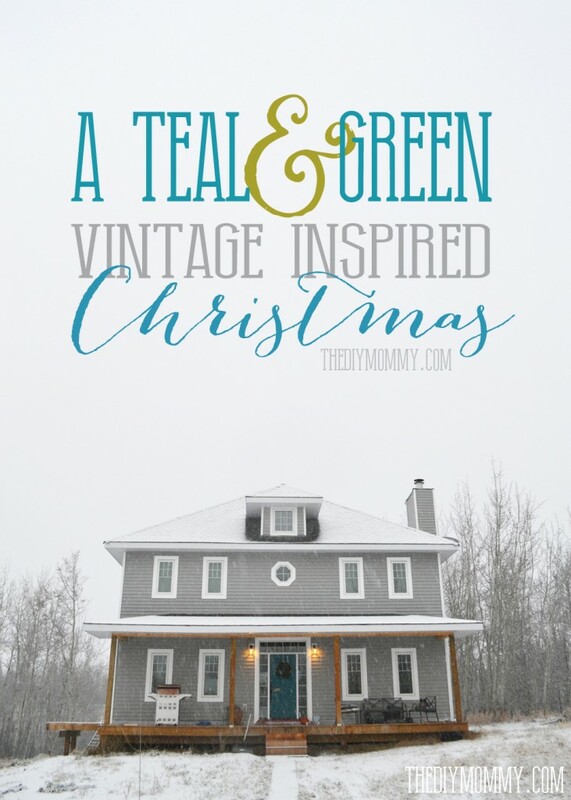 I love all the hits of turquoise, and it is so nicely balanced with the green and white. I would love to come and hang out and enjoy some eggnog while watching the snow come down (we are lucky if we get any snow:). Pinned and sharing on my FB page! So, so gorgeous. The teal and green colour scheme is so serene. It is Christmassy without the kitch. My favorites are the faux mercury glass jar and the bottle brush tees in the dome. Love, love, love. I love your colour scheme and I can’t believe that you have done all of this already. I feel like a slacker! 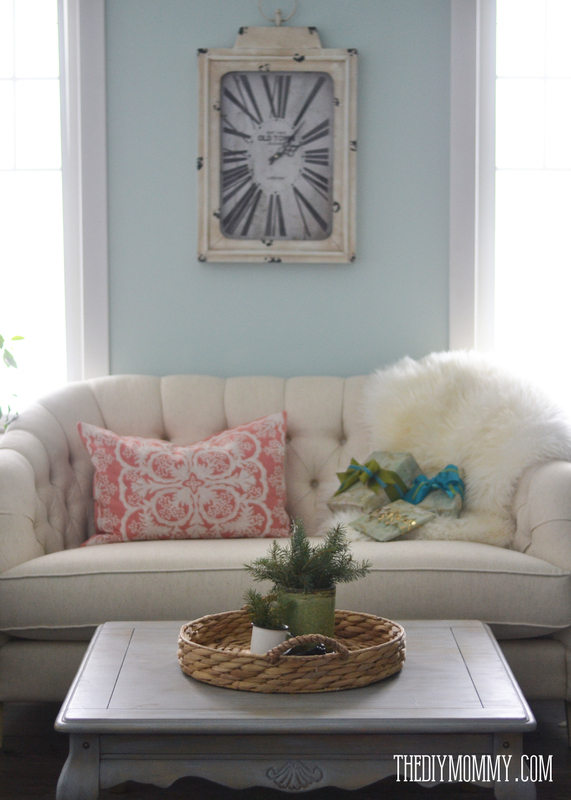 I LOVE the art over the mantel – it’s perfect there. absolutely stunning! 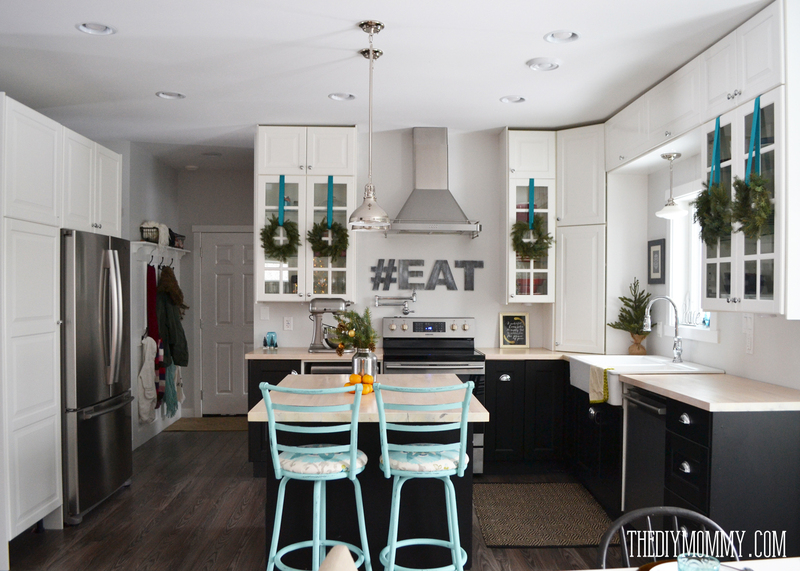 I love the wreaths on the kitchen cupboards! soo super cute. I love your home. So beautiful , just found your blog ! I love the turquoise . 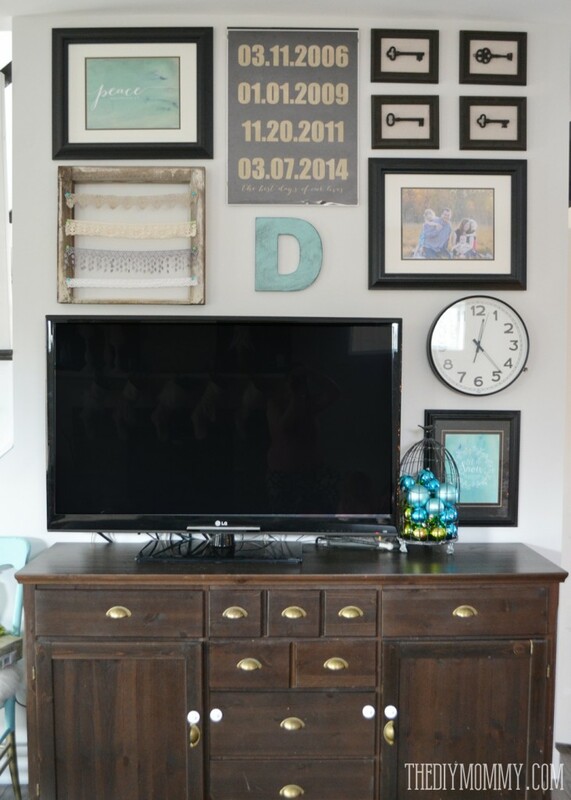 I also love your simplicity and the DIY art over your fireplace . Absolutely beautiful!! I love that giant cheese dish with the bottle brush trees. Great color scheme! I can’t wait to get my home tour together, I’m so going to link up! This is such a beautiful tour. So many incredible touches in your beautiful home. I now wish I had seen this before I bought my wreaths for my glass kitchen cabinets. Thanks for the gorgeous inspiration! I couldn’t even tell you my favourite part. I love everything about the decor. There are so many small details and it all comes together so nicely. Ok…so come do my house now? So pretty! I love that you used some unconventional Christmas colours – it’s so nice to change things up. I just love the simplicity of your decor while being fabulous at the same time. 🙂 I’m really excited about the pickle jar. I have an empty one in my pantry that has just been hanging out waiting for something exciting to happen to it. Thanks for the idea! [email protected] of Laughter recently posted..Make Screening In Airports A Breeze This Holiday Season with These Helpful Tips! It’s all just gorgeous Christina! Thanks so much for sharing. Merry Christmas to you! And we have the same Fischer Price nativity set for our kids. Isn’t it just the cutest thing? 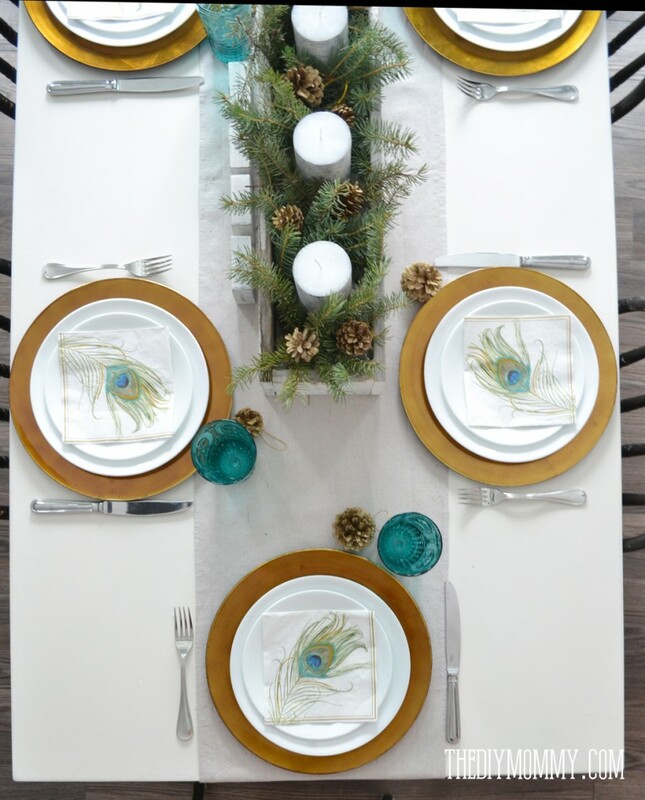 You have done such a spectacular job of decorating your home for the holidays with your teal color theme. I wish I could publish it in Better Homes and Gardens!! Teal and emerald green are my favorite colors and your inspirational ideas are so wonderful. Thank you so much for sharing your beautiful Holiday Home with all of us! Absolutely in love with all of it! Thank you for the inspiration to create something similar in my home! Where did you get your curtains?! They are EXACTLY what I’ve been looking for! I just found your page & I love your decorating. It helps that turquoise/teal is my favorite color. I co-own a Bed and Breakfast and we also do catered parties. We have 22 this December, so my decorating is all done. But I will use some of these next year. Simple and elegant. I love the colors and crisp white. Love all the greens too! Your home is beautiful! Thank you for sharing! Everything is beautiful! Love the color combination. 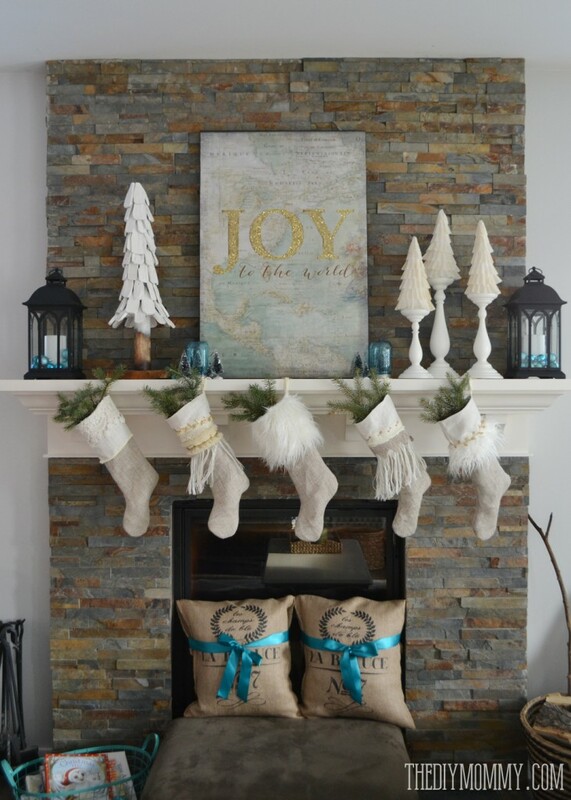 The JOY to the world picture above the mantle, did you make it? Happy Holidays! Thanks for sharing. Thanks so much, Jackie! Yes, I made the Joy to the World artwork and the details are here: http://thediymommy.com/vintage-glam-christmas-mantel-teal-gold-white-glitter-canvas-art/ Have a Happy New Year! Your home is beautiful Christina. You definitely have an eye for design! I’m always a pleasure meeting fellow Fanuck bloggers – I’m also from Alberta (Sherwood Park). Oh my goodness, should of proofed my comments. Meant to say It’s always a pleasure… and fellow Canuck… Geez! Thank you so much, Marie! Have a wonderful New Year! I had teal carpet in my Utah home we built in 1991. I don’t think I ever found a color that didn’t compliment it. Now I will have to dig out a photo. I don’t often find decor I comment on but love yours and can’t wait to finish mine here in Phoenix ( hopefully before the big day). Thanks so much, Kay! Happy New Year! 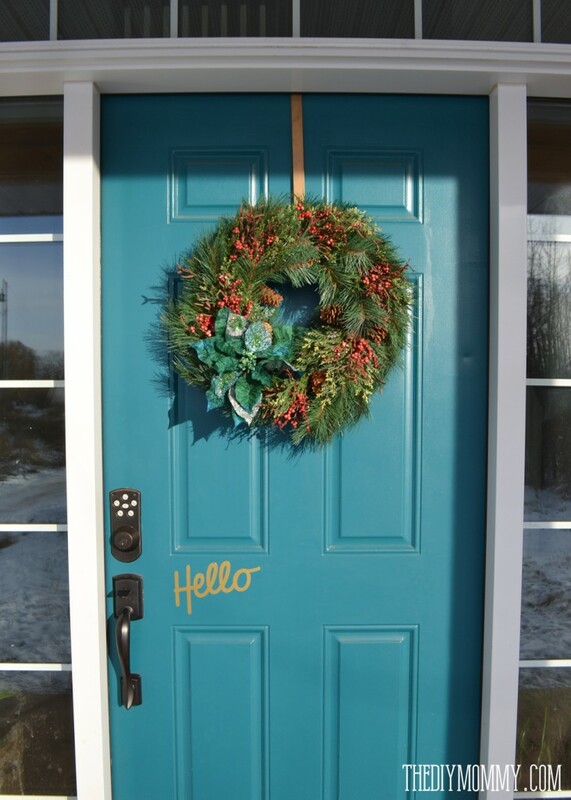 I love it, being rather fond of turquoise, I look for homes featuring my favorite color. You decorated it beautifully, not overdone. 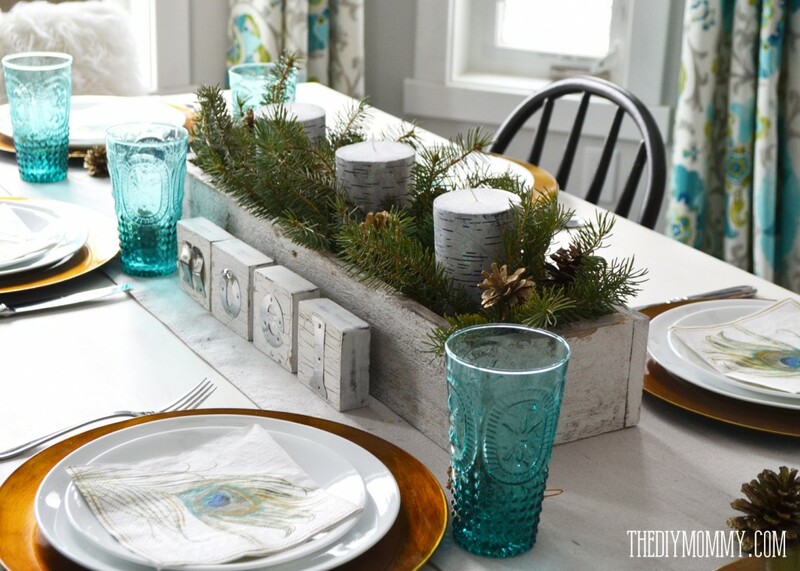 I especially like your Joy to the World art over the mantel and your table decor. I must thank Erin for finding you. Thank you so much, Mog! I appreciate your kind comments. You made my day! Thanks so much for visiting and for the feature, Nichole! Happy New Year! Amazing challenges in this article. I’m just extremely content to search your site HOME HEALTHCARE AGENCY IN MCLEAN|ARLINGTON |ANNANDALE|LORTON VA|POTOMAC|BOWIE|GAITHERSBURG|UPPER MALBORO|CHEVERLY,|MD|”Home in Alexandria|Virginia|Health in Alexandria|Care in Alexandria|Home Health Care in Alexandria|In-Home Care in Alexandria|Services in Alexandria|Home Heath Care Agency in Alexandria|Home Health Care Services in Alexandria|Caregivers in Alexandria|Caregiving in Alexandria,Skilled Nursing in Alexandria|Personal Care Assistance in Alexandria|Respite Care in Alexandria|Home in Virginia|Health in Virginia|Care in Virginia|Home Health Care in Virginia|In-Home Care in Virginia|Services in Virginia|Home Heath Care Agency in Virginia|Home Health Care Services in Virginia|Caregivers in Virginia|Caregiving in Virginia|Skilled Nursing in Virginia|Personal Care Assistance in Virginia|Respite Care in Virginia|Homecare|Home health agency in northern Va|Great Expectationsl Home Care|Home infusion,Geriatric care|Pediatric care|Live-in|Companion care|Home health aide|Personal care|Errands|Health care|Personal care aide|Nursing in home care|Private duty|Non-medical|Home health care|GREAT EXPECTATIONS HomeCare of Arlington/Alexandria| VA provides quality in-home care services such as senior care| dementia care| and respite for family caregivers| Call us today|”greatexpectations.info helps you find the right Arlington| VA home care agency for your loved ones. Talk to a senior care adviser to get started,Greatexpectations.info helps you find the right Arlington| VA home care agency for your loved ones| Talk to a senior care adviser to get started,McLean | Home Care Assistance | Home Care Assistance of McLean|Chain Bridge Road McLean senior home care elder care hourly live-in 703-884-1018 Virginia|Home Care Assistance of McLean | Looking for a home care agency in McLean Virginia | Find out what questions you need to ask and get a list of | Connecting Families to Senior Living |Potomac Home Health Care| Potomac Home Health Care Home Health Agency | Potomac Home Health Care in Rockville Maryland | MD|Potomac Home Health Care – Rockville Home Health Agency| Home Care in Montgomery County MD | Home Care Services Washington DC| home care| montgomery county md| home care agency| washington dc| home care services|home health care Alexandria VAhome health care Alexandria VAhome health care Alexandria VAhome health care Alexandria VA| home health care Alexandria VAhome health care Alexandria VA| home health care 22306|Complete list of home health care in Alexandria VA | cost| with contact info Compare pricing and quality| Home Health Aide Jobs| Employment in McLean| VA| McLean| VA careers| McLean| VA employment| McLean| VA job listings| McLean| VA job search| McLean| VA search engine| work in McLean| VA|Home Health Care in McLean, VA | Senior Care, In-Home Care | (703) 884-1018|care, occupational therapy, palliative care, physical therapy, hospice care, assisted living home health care, respite care, caregiver, pediatric nurse, senior helpers, Home care,elder care, home care assistance, in home care, senior care, elderly care, senior home care, medical assistance, homecare, nanny agency, child care services, eldercare, personal care, companion care, dementia care, alzheimers care, medical staffing, rehab care, skilled nursing, home healthcare, nanny service, nanny services, 24 hour home care, home health services, home healthcare agency, home nurse, non medical home care, babysitting agency, elderly home care, home care providers, nursing agency, outpatient care, senior care services|greatexpectations.info,GREAT EXPECTATIONS,,Home health care agency in Annandale, Alexandria (Old Town), Arlington, McLean, Woodbridge, Manassas, Fairfax city and county in VA and Prince George’s Cheverly, College Park , Baltimore City/County, Charles County, Bethesda – Chevy Chase, Gaithersburg, Beltsville, Greenbelt, Rockville, Hyattsville, Indian Head, Laurel, Takoma Park, Upper Marlboro and Montgomery in MD. Thank you and i am taking a look in front to the touch people. Would you like to nicely drop us a send? Fantastic website.. HOME HEALTHCARE AGENCY IN MCLEAN|ARLINGTON |ANNANDALE|LORTON VA|POTOMAC|BOWIE|GAITHERSBURG|UPPER MALBORO|CHEVERLY,|MD|”Home in Alexandria|Virginia|Health in Alexandria|Care in Alexandria|Home Health Care in Alexandria|In-Home Care in Alexandria|Services in Alexandria|Home Heath Care Agency in Alexandria|Home Health Care Services in Alexandria|Caregivers in Alexandria|Caregiving in Alexandria,Skilled Nursing in Alexandria|Personal Care Assistance in Alexandria|Respite Care in Alexandria|Home in Virginia|Health in Virginia|Care in Virginia|Home Health Care in Virginia|In-Home Care in Virginia|Services in Virginia|Home Heath Care Agency in Virginia|Home Health Care Services in Virginia|Caregivers in Virginia|Caregiving in Virginia|Skilled Nursing in Virginia|Personal Care Assistance in Virginia|Respite Care in Virginia|Homecare|Home health agency in northern Va|Great Expectationsl Home Care|Home infusion,Geriatric care|Pediatric care|Live-in|Companion care|Home health aide|Personal care|Errands|Health care|Personal care aide|Nursing in home care|Private duty|Non-medical|Home health care|GREAT EXPECTATIONS HomeCare of Arlington/Alexandria| VA provides quality in-home care services such as senior care| dementia care| and respite for family caregivers| Call us today|”greatexpectations.info helps you find the right Arlington| VA home care agency for your loved ones. Talk to a senior care adviser to get started,Greatexpectations.info helps you find the right Arlington| VA home care agency for your loved ones| Talk to a senior care adviser to get started,McLean | Home Care Assistance | Home Care Assistance of McLean|Chain Bridge Road McLean senior home care elder care hourly live-in 703-884-1018 Virginia|Home Care Assistance of McLean | Looking for a home care agency in McLean Virginia | Find out what questions you need to ask and get a list of | Connecting Families to Senior Living |Potomac Home Health Care| Potomac Home Health Care Home Health Agency | Potomac Home Health Care in Rockville Maryland | MD|Potomac Home Health Care – Rockville Home Health Agency| Home Care in Montgomery County MD | Home Care Services Washington DC| home care| montgomery county md| home care agency| washington dc| home care services|home health care Alexandria VAhome health care Alexandria VAhome health care Alexandria VAhome health care Alexandria VA| home health care Alexandria VAhome health care Alexandria VA| home health care 22306|Complete list of home health care in Alexandria VA | cost| with contact info Compare pricing and quality| Home Health Aide Jobs| Employment in McLean| VA| McLean| VA careers| McLean| VA employment| McLean| VA job listings| McLean| VA job search| McLean| VA search engine| work in McLean| VA|Home Health Care in McLean, VA | Senior Care, In-Home Care | (703) 884-1018|care, occupational therapy, palliative care, physical therapy, hospice care, assisted living home health care, respite care, caregiver, pediatric nurse, senior helpers, Home care,elder care, home care assistance, in home care, senior care, elderly care, senior home care, medical assistance, homecare, nanny agency, child care services, eldercare, personal care, companion care, dementia care, alzheimers care, medical staffing, rehab care, skilled nursing, home healthcare, nanny service, nanny services, 24 hour home care, home health services, home healthcare agency, home nurse, non medical home care, babysitting agency, elderly home care, home care providers, nursing agency, outpatient care, senior care services|greatexpectations.info,GREAT EXPECTATIONS,,Home health care agency in Annandale, Alexandria (Old Town), Arlington, McLean, Woodbridge, Manassas, Fairfax city and county in VA and Prince George’s Cheverly, College Park , Baltimore City/County, Charles County, Bethesda – Chevy Chase, Gaithersburg, Beltsville, Greenbelt, Rockville, Hyattsville, Indian Head, Laurel, Takoma Park, Upper Marlboro and Montgomery in MD A great deal of helpful tips the following. I am just sending them to a couple of close friends ans furthermore revealing within yummy. And indeed, thanks to ones sebaceous! HOME HEALTHCARE AGENCY IN MCLEAN|ARLINGTON |ANNANDALE|LORTON VA|POTOMAC|BOWIE|GAITHERSBURG|UPPER MALBORO|CHEVERLY,|MD|”Home in Alexandria|Virginia|Health in Alexandria|Care in Alexandria|Home Health Care in Alexandria|In-Home Care in Alexandria|Services in Alexandria|Home Heath Care Agency in Alexandria|Home Health Care Services in Alexandria|Caregivers in Alexandria|Caregiving in Alexandria,Skilled Nursing in Alexandria|Personal Care Assistance in Alexandria|Respite Care in Alexandria|Home in Virginia|Health in Virginia|Care in Virginia|Home Health Care in Virginia|In-Home Care in Virginia|Services in Virginia|Home Heath Care Agency in Virginia|Home Health Care Services in Virginia|Caregivers in Virginia|Caregiving in Virginia|Skilled Nursing in Virginia|Personal Care Assistance in Virginia|Respite Care in Virginia|Homecare|Home health agency in northern Va|Great Expectationsl Home Care|Home infusion,Geriatric care|Pediatric care|Live-in|Companion care|Home health aide|Personal care|Errands|Health care|Personal care aide|Nursing in home care|Private duty|Non-medical|Home health care|GREAT EXPECTATIONS HomeCare of Arlington/Alexandria| VA provides quality in-home care services such as senior care| dementia care| and respite for family caregivers| Call us today|”greatexpectations.info helps you find the right Arlington| VA home care agency for your loved ones. Talk to a senior care adviser to get started,Greatexpectations.info helps you find the right Arlington| VA home care agency for your loved ones| Talk to a senior care adviser to get started,McLean | Home Care Assistance | Home Care Assistance of McLean|Chain Bridge Road McLean senior home care elder care hourly live-in 703-884-1018 Virginia|Home Care Assistance of McLean | Looking for a home care agency in McLean Virginia | Find out what questions you need to ask and get a list of | Connecting Families to Senior Living |Potomac Home Health Care| Potomac Home Health Care Home Health Agency | Potomac Home Health Care in Rockville Maryland | MD|Potomac Home Health Care – Rockville Home Health Agency| Home Care in Montgomery County MD | Home Care Services Washington DC| home care| montgomery county md| home care agency| washington dc| home care services|home health care Alexandria VAhome health care Alexandria VAhome health care Alexandria VAhome health care Alexandria VA| home health care Alexandria VAhome health care Alexandria VA| home health care 22306|Complete list of home health care in Alexandria VA | cost| with contact info Compare pricing and quality| Home Health Aide Jobs| Employment in McLean| VA| McLean| VA careers| McLean| VA employment| McLean| VA job listings| McLean| VA job search| McLean| VA search engine| work in McLean| VA|Home Health Care in McLean, VA | Senior Care, In-Home Care | (703) 884-1018|care, occupational therapy, palliative care, physical therapy, hospice care, assisted living home health care, respite care, caregiver, pediatric nurse, senior helpers, Home care,elder care, home care assistance, in home care, senior care, elderly care, senior home care, medical assistance, homecare, nanny agency, child care services, eldercare, personal care, companion care, dementia care, alzheimers care, medical staffing, rehab care, skilled nursing, home healthcare, nanny service, nanny services, 24 hour home care, home health services, home healthcare agency, home nurse, non medical home care, babysitting agency, elderly home care, home care providers, nursing agency, outpatient care, senior care services|greatexpectations.info,GREAT EXPECTATIONS,,Home health care agency in Annandale, Alexandria (Old Town), Arlington, McLean, Woodbridge, Manassas, Fairfax city and county in VA and Prince George’s Cheverly, College Park , Baltimore City/County, Charles County, Bethesda – Chevy Chase, Gaithersburg, Beltsville, Greenbelt, Rockville, Hyattsville, Indian Head, Laurel, Takoma Park, Upper Marlboro and Montgomery in MD Hello, Neat posting. You will find there’s problem with your internet site in ie, would likely click here? IE nonetheless would be the industry director as well as a enormous a part of other individuals will certainly omit the good writing as a result issue. Love the pictures!! What is your paint color? Thanks, Amy! We have Valspar Seashell Grey on most walls, and Valspar Distant Valley (the green/blue) on the others. A person Often using outings your internet site frequently as well as advisable this with me to study for the reason that nicely HOME HEALTHCARE AGENCY IN MCLEAN|ARLINGTON |ANNANDALE|LORTON VA|POTOMAC|BOWIE|GAITHERSBURG|UPPER MALBORO|CHEVERLY,|MD|”Home in Alexandria|Virginia|Health in Alexandria|Care in Alexandria|Home Health Care in Alexandria|In-Home Care in Alexandria|Services in Alexandria|Home Heath Care Agency in Alexandria|Home Health Care Services in Alexandria|Caregivers in Alexandria|Caregiving in Alexandria,Skilled Nursing in Alexandria|Personal Care Assistance in Alexandria|Respite Care in Alexandria|Home in Virginia|Health in Virginia|Care in Virginia|Home Health Care in Virginia|In-Home Care in Virginia|Services in Virginia|Home Heath Care Agency in Virginia|Home Health Care Services in Virginia|Caregivers in Virginia|Caregiving in Virginia|Skilled Nursing in Virginia|Personal Care Assistance in Virginia|Respite Care in Virginia|Homecare|Home health agency in northern Va|Great Expectationsl Home Care|Home infusion,Geriatric care|Pediatric care|Live-in|Companion care|Home health aide|Personal care|Errands|Health care|Personal care aide|Nursing in home care|Private duty|Non-medical|Home health care|GREAT EXPECTATIONS HomeCare of Arlington/Alexandria| VA provides quality in-home care services such as senior care| dementia care| and respite for family caregivers| Call us today|”greatexpectations.info helps you find the right Arlington| VA home care agency for your loved ones. Talk to a senior care adviser to get started,Greatexpectations.info helps you find the right Arlington| VA home care agency for your loved ones| Talk to a senior care adviser to get started,McLean | Home Care Assistance | Home Care Assistance of McLean|Chain Bridge Road McLean senior home care elder care hourly live-in 703-884-1018 Virginia|Home Care Assistance of McLean | Looking for a home care agency in McLean Virginia | Find out what questions you need to ask and get a list of | Connecting Families to Senior Living |Potomac Home Health Care| Potomac Home Health Care Home Health Agency | Potomac Home Health Care in Rockville Maryland | MD|Potomac Home Health Care – Rockville Home Health Agency| Home Care in Montgomery County MD | Home Care Services Washington DC| home care| montgomery county md| home care agency| washington dc| home care services|home health care Alexandria VAhome health care Alexandria VAhome health care Alexandria VAhome health care Alexandria VA| home health care Alexandria VAhome health care Alexandria VA| home health care 22306|Complete list of home health care in Alexandria VA | cost| with contact info Compare pricing and quality| Home Health Aide Jobs| Employment in McLean| VA| McLean| VA careers| McLean| VA employment| McLean| VA job listings| McLean| VA job search| McLean| VA search engine| work in McLean| VA|Home Health Care in McLean, VA | Senior Care, In-Home Care | (703) 884-1018|care, occupational therapy, palliative care, physical therapy, hospice care, assisted living home health care, respite care, caregiver, pediatric nurse, senior helpers, Home care,elder care, home care assistance, in home care, senior care, elderly care, senior home care, medical assistance, homecare, nanny agency, child care services, eldercare, personal care, companion care, dementia care, alzheimers care, medical staffing, rehab care, skilled nursing, home healthcare, nanny service, nanny services, 24 hour home care, home health services, home healthcare agency, home nurse, non medical home care, babysitting agency, elderly home care, home care providers, nursing agency, outpatient care, senior care services|greatexpectations.info,GREAT EXPECTATIONS,,Home health care agency in Annandale, Alexandria (Old Town), Arlington, McLean, Woodbridge, Manassas, Fairfax city and county in VA and Prince George’s Cheverly, College Park , Baltimore City/County, Charles County, Bethesda – Chevy Chase, Gaithersburg, Beltsville, Greenbelt, Rockville, Hyattsville, Indian Head, Laurel, Takoma Park, Upper Marlboro and Montgomery in MD. How the strategy of publishing is fantastic knowning that this content is top-notch. Information insight you provide out there that this followers! I love so many things about this post and I am just seeing your blog for the first time. I too loan turquoise and used it this year for Christmas. I see so many details in your photos that I just love!! Thanks so much for visiting, Jennifer. I love turquoise! This is very me. I love every single detail. Appreciation for some other terrific submit.. HOME HEALTHCARE AGENCY IN MCLEAN|ARLINGTON |ANNANDALE|LORTON VA|POTOMAC|BOWIE|GAITHERSBURG|UPPER MALBORO|CHEVERLY,|MD|”Home in Alexandria|Virginia|Health in Alexandria|Care in Alexandria|Home Health Care in Alexandria|In-Home Care in Alexandria|Services in Alexandria|Home Heath Care Agency in Alexandria|Home Health Care Services in Alexandria|Caregivers in Alexandria|Caregiving in Alexandria,Skilled Nursing in Alexandria|Personal Care Assistance in Alexandria|Respite Care in Alexandria|Home in Virginia|Health in Virginia|Care in Virginia|Home Health Care in Virginia|In-Home Care in Virginia|Services in Virginia|Home Heath Care Agency in Virginia|Home Health Care Services in Virginia|Caregivers in Virginia|Caregiving in Virginia|Skilled Nursing in Virginia|Personal Care Assistance in Virginia|Respite Care in Virginia|Homecare|Home health agency in northern Va|Great Expectationsl Home Care|Home infusion,Geriatric care|Pediatric care|Live-in|Companion care|Home health aide|Personal care|Errands|Health care|Personal care aide|Nursing in home care|Private duty|Non-medical|Home health care|GREAT EXPECTATIONS HomeCare of Arlington/Alexandria| VA provides quality in-home care services such as senior care| dementia care| and respite for family caregivers| Call us today|”greatexpectations.info helps you find the right Arlington| VA home care agency for your loved ones. Talk to a senior care adviser to get started,Greatexpectations.info helps you find the right Arlington| VA home care agency for your loved ones| Talk to a senior care adviser to get started,McLean | Home Care Assistance | Home Care Assistance of McLean|Chain Bridge Road McLean senior home care elder care hourly live-in 703-884-1018 Virginia|Home Care Assistance of McLean | Looking for a home care agency in McLean Virginia | Find out what questions you need to ask and get a list of | Connecting Families to Senior Living |Potomac Home Health Care| Potomac Home Health Care Home Health Agency | Potomac Home Health Care in Rockville Maryland | MD|Potomac Home Health Care – Rockville Home Health Agency| Home Care in Montgomery County MD | Home Care Services Washington DC| home care| montgomery county md| home care agency| washington dc| home care services|home health care Alexandria VAhome health care Alexandria VAhome health care Alexandria VAhome health care Alexandria VA| home health care Alexandria VAhome health care Alexandria VA| home health care 22306|Complete list of home health care in Alexandria VA | cost| with contact info Compare pricing and quality| Home Health Aide Jobs| Employment in McLean| VA| McLean| VA careers| McLean| VA employment| McLean| VA job listings| McLean| VA job search| McLean| VA search engine| work in McLean| VA|Home Health Care in McLean, VA | Senior Care, In-Home Care | (703) 884-1018|care, occupational therapy, palliative care, physical therapy, hospice care, assisted living home health care, respite care, caregiver, pediatric nurse, senior helpers, Home care,elder care, home care assistance, in home care, senior care, elderly care, senior home care, medical assistance, homecare, nanny agency, child care services, eldercare, personal care, companion care, dementia care, alzheimers care, medical staffing, rehab care, skilled nursing, home healthcare, nanny service, nanny services, 24 hour home care, home health services, home healthcare agency, home nurse, non medical home care, babysitting agency, elderly home care, home care providers, nursing agency, outpatient care, senior care services|greatexpectations.info,GREAT EXPECTATIONS,,Home health care agency in Annandale, Alexandria (Old Town), Arlington, McLean, Woodbridge, Manassas, Fairfax city and county in VA and Prince George’s Cheverly, College Park , Baltimore City/County, Charles County, Bethesda – Chevy Chase, Gaithersburg, Beltsville, Greenbelt, Rockville, Hyattsville, Indian Head, Laurel, Takoma Park, Upper Marlboro and Montgomery in MD The spot different could any person get that style of information and facts such a perfect method of publishing? I own a demonstration in a few days, with this particular to the look for such information. Great job! 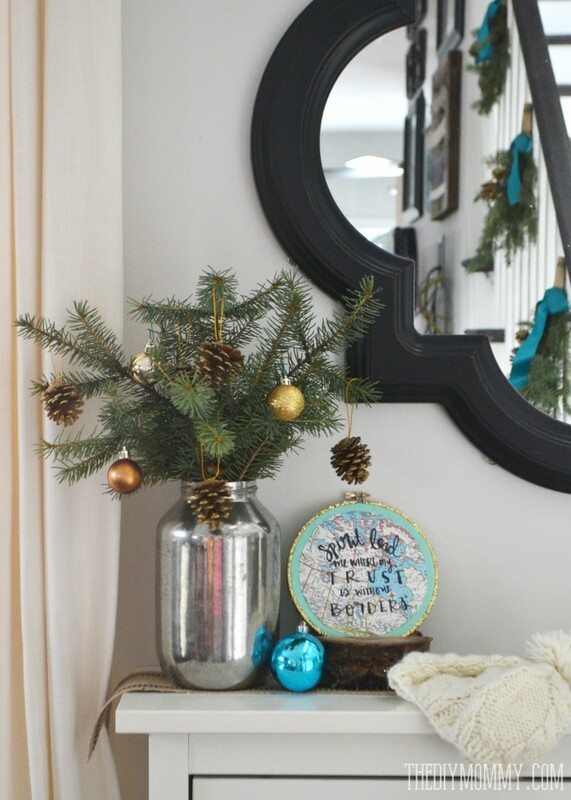 I was wondering what the round ornament on the table says- “Spirit lead me… without borders”? I like it!